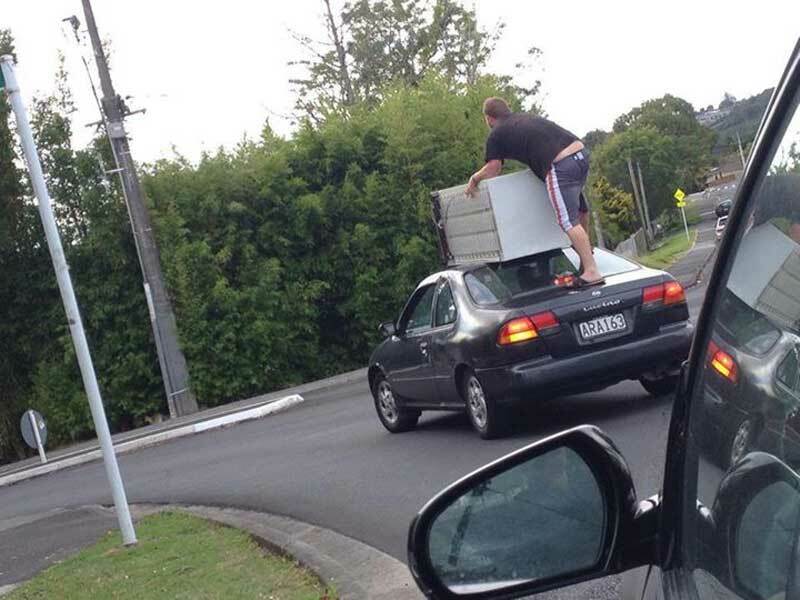 A group of men in West Auckland, New Zealand, who used ingenuity over common sense to shift a fridge now have the police on their trail. They were spotted driving in Titirangi towards Glen Eden on Friday afternoon. A large fridge was perched on the roof of a two-door Nissan and to keep it in place, one man stood on the boot holding it down as another drove. Police are now keen to speak to the "brains" behind the operation. "The consequences of injury to this person and other road users as well as potential damage to other vehicles is obvious," said the Waitakere police area commander, Inspector Scott Webb. Road safety group Brake were also unimpressed. "This behaviour is dangerous and totally irresponsible," said director Caroline Perry. "They are not only putting themselves at risk, but also other road users, particularly more vulnerable users like pedestrians and cyclists. If something went wrong there could have been devastating consequences." If only there was some unique identifying thing in the photograph by which we could identify these people!